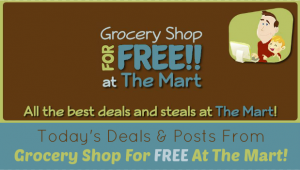 Today’s Deals and Posts From Grocery Shop for FREE at The Mart! Here’s what went up on the blog Today! Ask a Walmart Expert: Will Walmart Ad Match Drug Stores? Tide Washing Machine Cleaner Only $6.86 at Walmart! Walmart Values of the Day: Kid’s Comforter Set Just $29.88 or 1250W Microwave for $99.88! Crest Stages Toothpaste Only $1.47 at Walmart! Schwarzkopf Ultime Hair Products Only $2.47 at Walmart!